What is it: An advanced attack helicopter that's been in service since the mid-1980s but remains a force to be reckoned with. It has a 30 mm chain gun with 1,200 rounds as well as rockets, missiles and substantial armor. 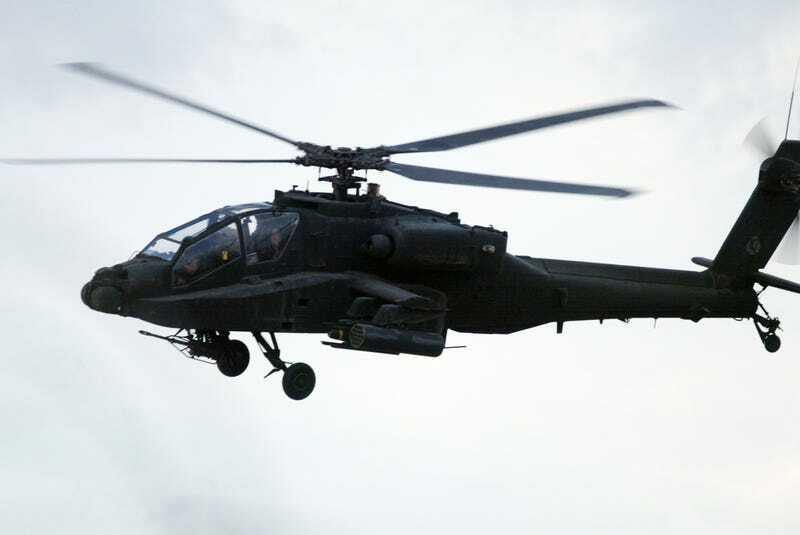 How it's like The Bat: If Batman didn't have The Bat, odds are, he'd fly an Apache. Aside from also having rotors, seems pretty comparable to Bruce Wayne's new ride in terms of firepower. The cockpit design is very similar as well; like the Apache, The Bat's passengers sit tandem, one in front of the other. What is it: The Harrier is capable of taking off vertically, eliminating the need for a runway and making it deployable in cramped areas or aircraft carriers. Thrusters rotate downward, pushing the fighter jet off the ground and into the air. How it's like The Bat: Batman's new toy may technically be a helicopter because it has rotors, but it takes some functional cues from the Harrier. The Bat also performs some pretty crazy aerobatic maneuvers, making it fly more like a fighter jet than a helicopter. What is it: A tilt rotor aircraft that is a fusion of plane and helicopter, it uses its twin rotors to perform vertical takeoffs. The Osprey has been controversial due to its excessive development costs and safety record, but it has proven useful for many applications, including search and rescue and combat. How it's like The Bat: The Bat also incorporates elements of both planes and helicopters, and has the same level of versatility as the Osprey. It's also probably just as expensive. What is it: Another tilt rotor like the Osprey - another Bell product with which it shares some design features - the Eagle Eye has two huge rotors on either side. Unlike the Osprey, the Eagle Eye is an unmanned aerial vehicle, also called a drone. It's highly maneuverable, like a plane, and meant to go into the most dangerous areas in the world so that human beings don't have to. How it's like The Bat: Like the Eagle Eye, The Bat flies thanks to the two rotors on either side of its body. What is it: The Cypher is a drone that flies thanks to rotors enclosed in a donut-like housing. If you've ever played Metal Gear Solid 2, you've shot at plenty of these. How it's like The Bat: The Bat also has enclosed rotors like the Cypher, and with its autopilot feature it could also be considered a drone of sorts.